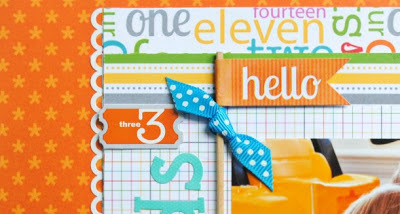 I'm back today with another colorful page from the May kit at My Creative Scrapbook. The kit featured the Take Note collection from Doodlebug Designs. This collection has an office supply theme and I thought the number paper and the bright colors worked well for this photo of my son with his preschool friends. Though the kids' clothes don't match the orange and aqua featured in the patterned papers, I thought the overall colorful vibe worked. I don't worry much about matchy matchy and I very rarely convert my photos to black and white. To play on the office supply theme, I made a paperclip flag as an embellishment on the journaling block. I used an ordinary paper clip (included in the kit) as they base. I cut down a Doodlebug sticker then wrapped it around the paperclip to secure it. To print the journaling on graph paper, I cut a piece of graph paper larger than I needed and adhered it to printer paper using washi tape. I ran the paper through the printer, removed the washi tape then cut the journaling block accordingly. I left room at the top for embellishments. I repeated the flag at the top of the layout, using a "hello" sticker and a bit of polka dot ribbon, also included in the kit. The kits at My Creative Scrapbook are packed FULL of goodies. I look forward to mine each month. Pam, the owner, is running a special this month on the kits and you could win this awesome Prima package. Four prizes are up for grabs! You can find the details on the My Creative Scrapbook blog. Have a great week! Awesome page! and what a super cute photo! izzy that photo is simply priceless!! love it and your layout is stunning!! I love this layout! It's such a great photo and the colors and papers compliment it perfectly. The whole thing just screams, "Happy!" This is such a happy page, Izzy. 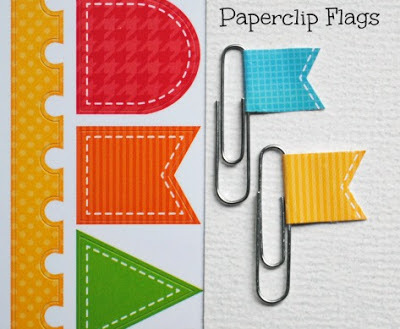 I love all of the color and how you used the banner stickers as part of your journaling spot and on the paper clip. I love that you created flags from paper clips. Ingenious!! Izzy! You are so talented!!! Keep up the fantastic work! OMYGOSH!!! This is ADORABLE!! I love love love love the colors and photo!!! You made it really, really hard for me to chose which MCS kit I wanted. I kept being drawn to the colors in the kit you used. You did an AMAZING job on these layouts!! ADORABLE!!! :) Love the LO, especially those flags! Super cute!